There can be few doubts about the authentic Coates style when we have so many of his recordings surviving from 1933 to 1955. They were variously made for Decca, HMV, Columbia and Pye-Nixa. This is not a composer beholden to his orchestras and companies. He held a position of great public affection from which he called the shots so we can assume that what we hear was what he intended. For Your Delight (1937) is a winsome but not very English serenade-waltz redolent of Fibich and the never-never land of Bohemia. Wood Nymphs (1917) is surprisingly quick-footed with Coates not squeezing sentiment. He adopted exactly the same tight-lipped and dry-eyed line when recording By the Sleepy Lagoon in 1935 and Footlights in 1940. Disc 1 ends with Sound and Vision - the ATV march brightly recorded in 1955. Easy-going Dvoř�kian honey is gently ladled through On the Edge of the Lake from the suite Summer Days (1919) but is that a dash of the Irish-lachrymose I hear. Was this what people ached for after the Great War? Coates was a master of the catchily sentimental! By the Tamarisk reeks more of Bohemia's woods and fields than of frangipane. The Three Bears Fantasy is suitably fantastic and with a dramatic Hispanic accent. This version was recorded in 1945, twenty years after it had been written. He spread his creative wings again in 1929 for the Cinderella Phantasy being a form well attuned to the free-spirited Royal Academy of Music from which he had come. Is a Song by the Way deliberately Delian: I think it might be. The recording quality is very good testimony to the recreative skills of� Peter Dempsey (who also writes the good notes - there are no poor ones) and Alan Bunting but the 1933 London Suite in which an unnamed orchestra is conducted by the composer perhaps cannot help sounding papery and insubstantial. The Saxo-Rhapsody here played by world famous Sigurd Rascher is amongst my favourite Coates. Nowhere in this work does Coates descend into that wince-making sentimentality he could so easily relax into. It is a lovely piece and is splendidly played by Rascher. Its undulant themes recall the Glazunov concerto dating from about the same time; no matter, it is wonderful stuff - part Delian dream and part Tchaikovsky 5. Strongly recommended. The second CD blasts off with the queasy Oxford Street March but as if in compensation this London Again suite includes one of Coates' most poker-faced and successful slow movements - the affecting Langham Place Elegy - treasurable stuff. It has a glowing trio section that would grace any great snappy march. The mid-1930s were a productive time for Coates as we can hear in the rather hackneyed-bland Springtime Suite although the final Dance in the Twilight is good and kicks the trend rather well. The The Princess arrives (1932) is absurdist stuff with its diminutive fanfares and toy soldier marching. The Three Elizabeths from 1940-44 is classic Coates. Certainly Halcyon Days starts well even if it tapers off into superficial jauntiness. That splendid fanfare is well used again in Springtime in Angus for Elizabeth of Glamis where gentle winds do �shake the darling buds of May�. Shame that Youth of Britain slips back into that all-purpose jaunty manner like a glove. Also pleasing is the Four Centuries Suite where the centuries are imaginatively hymned. Each hundred year period is portrayed in music that is silvery and poetic and gravely grand with frankly little differentiation between the first three movements. It is only when we get to the 20th century - Rhythm that we get a dramatic change of gear. It's jazzily syncopated - wah-wah and all - Gershwin with an English accent. It relaxes for some smoochy strict-time ballroom at 1:59 before resuming the jazz stuff reminiscent of the big rumpuses sported by the George and Ira Gershwin musicals. High-spirited stuff and it still works. Classic Coates ends the collection with The Dam Busters March. Coates knows his stuff and italicises the introduction to the grand march on its second appearance. 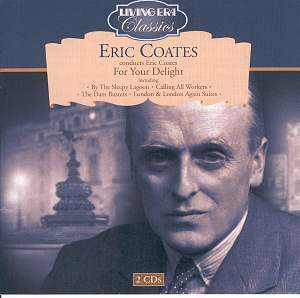 Supremely popular Coates died while still well-loved and with new recordings being made. The frost that fell over British light music descended in the 1960s and tightened its grip well into the 1980s. Coates was not there to see it. At first glance I thought this set was a direct reissue of a long-deleted double disc set issued by Conifer in 1994-97. No such thing - although there is some overlap. Full discographical information is provided even if I have abbreviated it for this review. Vintage Coates conducted by Coates - mono and historic but enjoyable in its own right and strongly recommendable for the Saxo-Rhapsody, Halcyon Days, Four Centuries, A Song by the Way and the two Phantasies. Across two generously packed CDs old friends, surprising delights and tired classics jostle for place. A Coates treasury and no mistake. I carefully say 1950s because I have heard various views on whether they come from 1951 or 1953 and my efforts to track down details have so far failed. We hope to contact Decca/Universal next week to see if their record cards shed any light on the sessions. They must have been reviewed in The Gramophone at the time but I don't have any access to their archives. My thoughts at the moment are that they were released in 1953 as they are not in my Decca LP catalogue which includes everything issued up to January 1952 but, of course, the release date does not necessarily reflect the recording date. Both the 78 and LP recordings were in the Decca catalogues simultaneously for a while and as, in the early 50s, Decca were still re-mastering and re-issuing many of their superb ffrr 78s on LP, I assumed, that they were the same recordings, Decca having simply "re-named" the orchestra for marketing purposes. This error does not of course make the set any less enjoyable - indeed, having now dug out the old Conifer 2CD set which does have the 78s on it to do the comparison, these later versions are, in my view superior. I should make it clear that the Living Era transfers from the original discs were done by Peter Dempsey and that I was responsible for the restoration and re-mastering work - both essential to the process but neither any good, one without the other! Further research reveals that these versions of The Four Centuries and The Three Elizabeths suites were recorded on 20 May 1953.